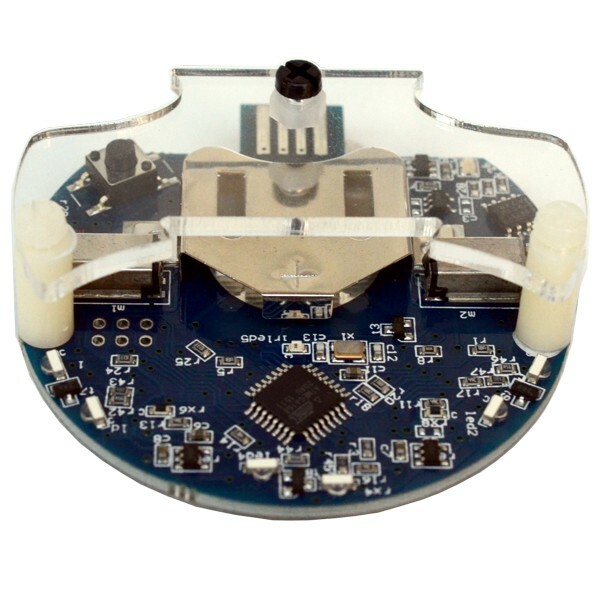 The AERobot Affordable Education Robot is a tiny vibrating robot kit intended for teaching middle school students about robotics and programming. The AERobot uses a collection of IR Infrared light emitters and sensors to detect obstacles, follow lines and find light sources. Two miniature vibration motors drive the robot. A multicolored LED provides visual feedback. The robot plugs directly into a USB port for programming and charging. This educational robot is programmed using the kid friendly miniBloq graphical programming environment. A sample curriculum is available for teaching introductory programming and robotics. The Affordable Education Robot comes as a kit requires some assembly. All electronics are full assembled but a few of the parts must be screwed together. A rechargeable lithium coin battery is included.